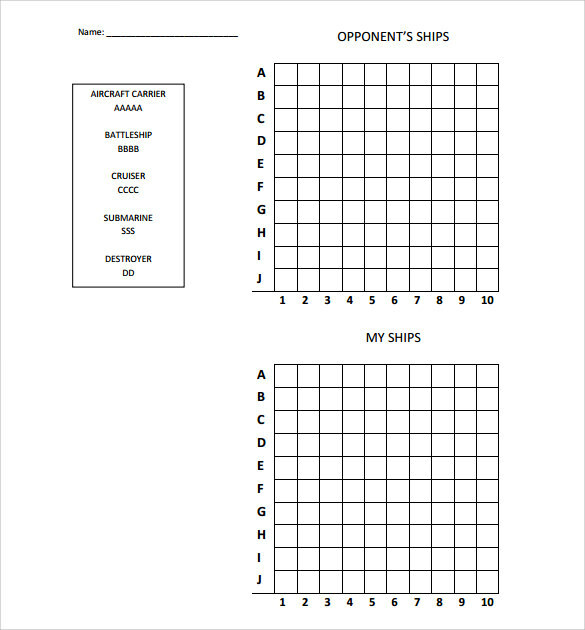 The battleship game is a guessing game where two players place their navy ships in a Game Board that has corresponding positions or coordinates where their opponent must guess which coordinates they have positioned their battleship, every correct guess means they hit the target and who ever hit all the battleship wins. This recreational tool will give you the excitement you need and analyze the pattern when having to predict where your opponent places all his or her ships, this game is simple yet very interesting to play. The sample format for this Board Games is free online where you can download it for free or if you want to play it like the old times then you can just buy it in toy stores. The battleship game is mainly for kids to play but adults can also join this game if they are fan of this board game. 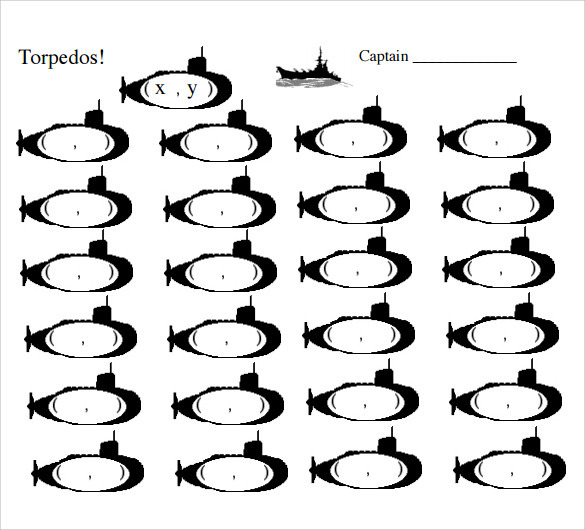 This template is a sample for battleship game. It contains two grids for both players and the instructions about to play the game. This template is good for the people who are playing this game for the first time as it contains the rules of game and other important details. This template can also be used by printing on the paper. This template is to help the online player of the game so that they can practice the same on paper if they don’t have access to the computers. 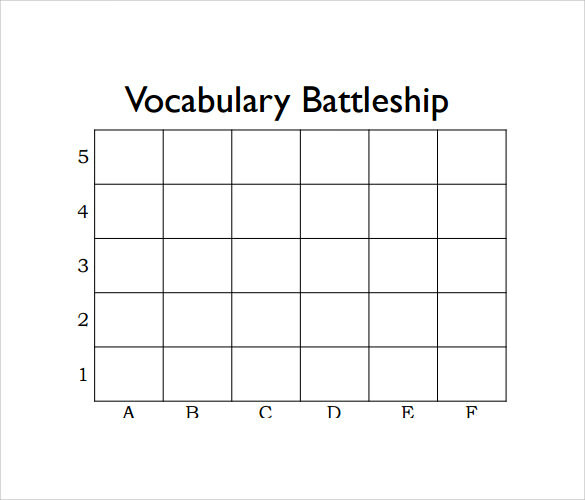 This template is designed according to the online game of battleship and there are two points for both players under every torpedo. A person needs to place his/her ship at the right place where his opponent can’t guess his location. This is the template for the rules of the famous battlefield game. This template contains the rules of the game and same can be downloaded and printed to play the game and to avoid the cheating in game. These rules also speak about the general eligibility of players and the team compositions for the game. 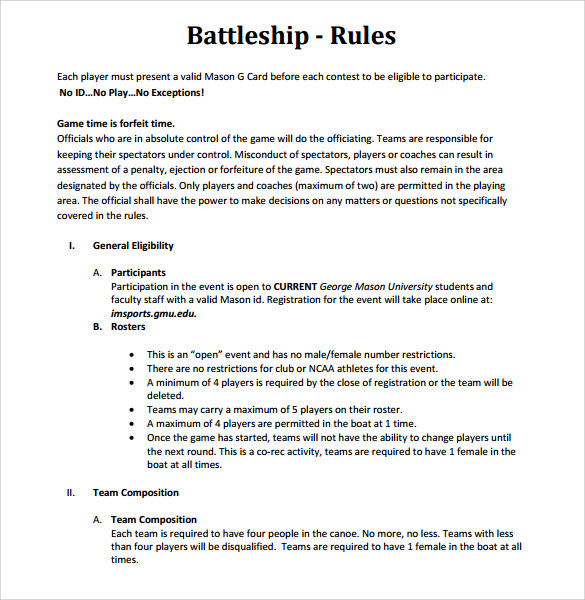 If you looking organize the battlefield game championship then you can use this template to describe the rules of the game. This template is designed in the Microsoft PowerPoint and it is very impressive. This template is very good for playing the battlefield game. 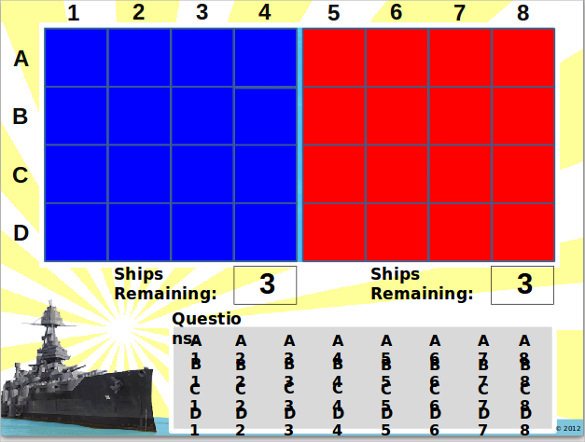 Moreover this template is designed for two players and also has the ship count for each player. If you are looking for some unique template for the battleship game then you can simply download the template from here and can enjoy the game. 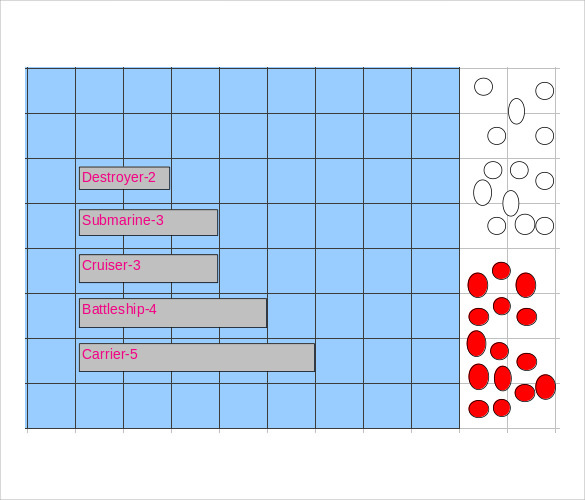 Why we need Battleship Game template? Well designed templates for the famous battlefield game are always in demand. This game is very effective in brain development of a child and also people of all age love t play this game. If you going for a picnic where you don’t have access to computers then these template will help you in playing the game anywhere. You just need to download the template according to you requirement. 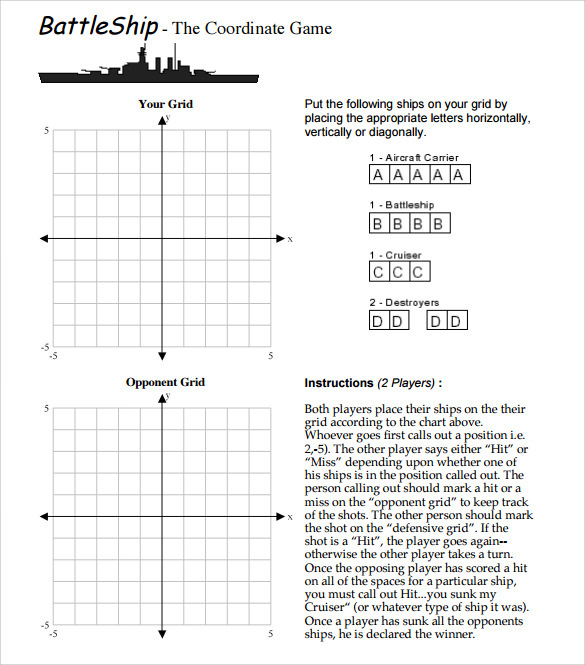 When we need Battleship Game Template? If you out for a picnic or you’re and you don’t have access to computers then you can just use the prints of these templates to play the game. These templates will also provide you the complete list of rules of the game if you are organizing the championship for the game or just simply playing in group. It’s always good to have some handy games in hand while enjoying picnic or travelling. These templates are great help for the people who are looking for some offline solution of battlefield game. You can also see Dot Game Templates. 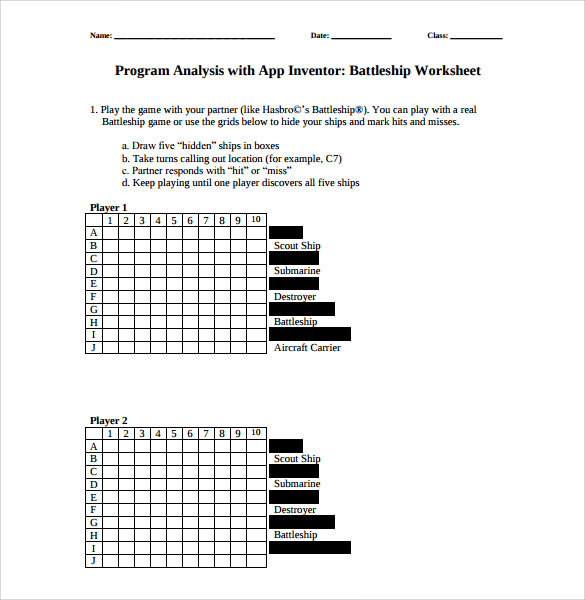 How These Battleship Game Templates will help you? Professionally designed battleship game template not only will help people who are willing to play the game without computers but also to the people who are looking for some board game to play while picnic or outing with friends. These templates can also be used in classrooms for the kids as this game boosts the intellectual level of the brain and also help in guessing the opponent’s strategy. 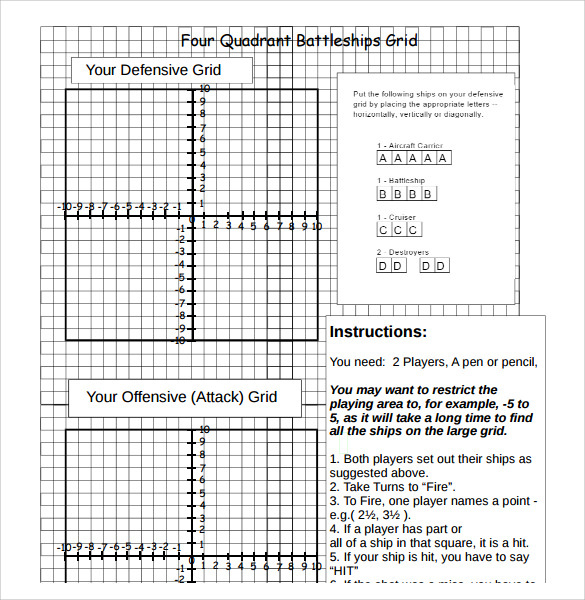 Templates given here are designed by professional to help the people who are seeking to play the battleship game without computer or want to understand the working of the game. There are templates in almost all formats to help the players to just download the template and after taking the print they can play the game easily.